"Tricksta & UK Runnings is back with another superb FREE mixtape. 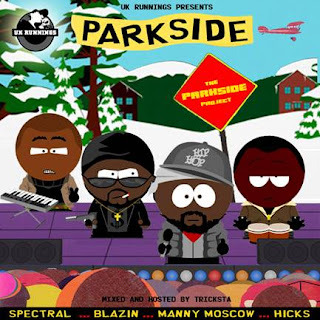 This time we go over to South West London to Parkside where we get a fourteen track collection from rappers Manny Moscow, Blazin, Hicks and Spectral. Production comes with four tracks from Wolftown’s Tricksta, as well as contributions from Downtown Soul’s Beat Thief, the well-respected Miss Tofelees, as well as iYun Fist. The mixtape also sees one of the UK’s best scratch DJ’s Jabba Tha Kut contribute on the superb ‘Deep Vibes’ track. We all know Manny Moscow from his superb street album ‘The Boy With The Lost Flow’ but this is a chance to get to know the other members of Parkside."